Employee Directory creates beautiful employee profiles. Employees can share their bio, skills, and fun facts about themselves, leading to stronger working relationships. 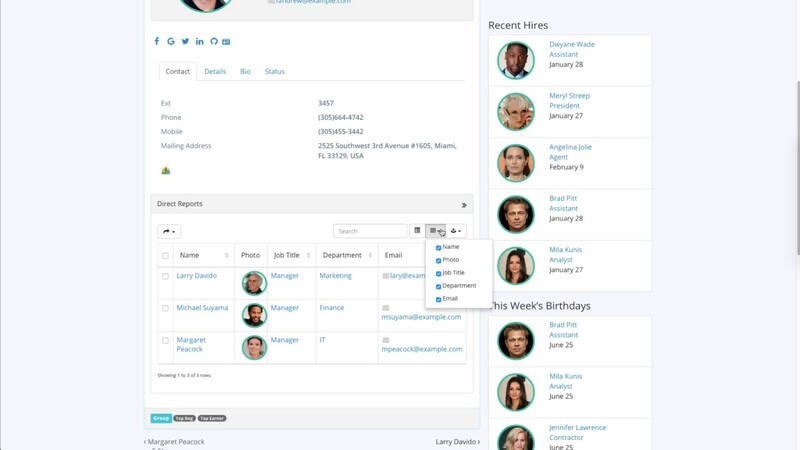 Showcase your employees with powerful profile pages. Display your employee photo and job title, department and manager. Display all employee contact information such as email, phone and address with map. Display your employee location, groups, skills, hire date and more. Display a list of direct reports of an employee with search and export features. Display bio, status and details tabs. Self-adjusting interface only displays information available for an employee. For example, if there is no Bio available, Bio tab is not displayed. Create and display unlimited custom fields on profile pages. A very well designed plugin with good documentation and excellent technical support. Highly recommended for those looking to quickly build and maintain an employee directory. Effective internal and external communications are key factors that contribute to your team's success. Get started now. Sign up to get Employee Directory news and updates.